Precision forged from a sinlge piece of high carbon, stainless steel. Tiny but mighty is the theme here. 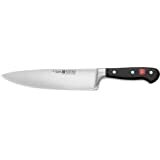 This innovative, short 12 cm (4.5”) cook’s knife is the perfect alternative to an everyday paring knife. 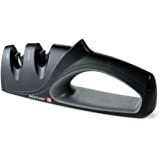 It features a short blade for easy control. 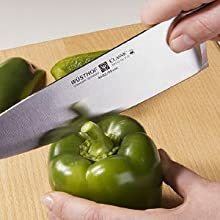 The unique WÜSTHOF rocker makes for effortless chopping and slicing of most food. It is sturdy and rigid enough to crush garlic. In short, an excellent all around forged knife that you´ll find hard to put down. 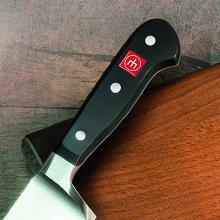 Caution: cook´s knives purposely have been ground extra thin for the ultimate cutting performance. Chopping through bones will damage the fine edge. Quality - Made in Solingen / Germany. 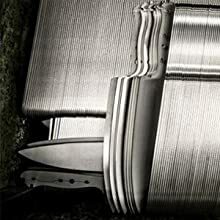 Today, Wüsthof's forged knives bearing the famous Trident logo are manufactured at 3 production plants in Solingen, which has become known as the 'City of Blades'. 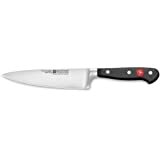 Wüsthof''s Classic Chef's Knife is the work horse of the kitchen, or the essential kitchen knife. 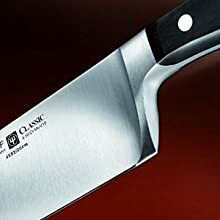 The Chef's knife is an indispensable all-purpose kitchen knife that can be used for chopping, mincing, slicing and dicing. 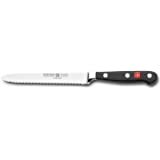 Due to the weight and balance of the knife, it is also perfect for heavy duty work such as cutting thicker vegetables and meats. Precision-forged from a single piece of an exclusive high-carbon stainless steel that resists stains and corrosion. 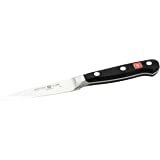 Full tang is triple riveted to the polymer handle for exceptional durability and seamless, completely hygienic fit. 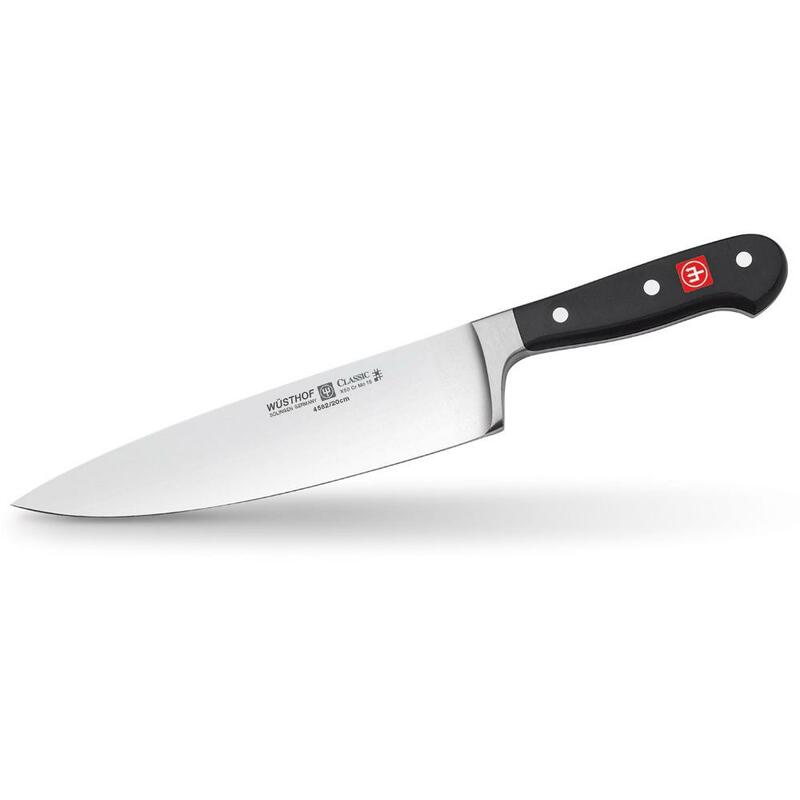 Wüsthof's Classic Chef's Knife features a full bolster and finger guard for safety, comfort, and control. WOW! Sharp & Very Balanced!! This is the best knife ever. Fits comfortable in my hand to allow safe and precise chopping, cutting, trimming etc. I love this knife! I love the shape, size and feel. This knife is a bit different than any other knife I have. I gave it to my husband for his birthday but it was really for me. I bought this knife and a similar 6-inch Wustof knife. I returned this one because, when I saw it, I thought this knife was awkwardly stubby and I couldn't think of a single case when I would use it. At this length, I would want a much thinner knife. I use this everyday. 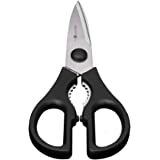 Its shape and size is perdect and stays sharp for a long time!